Today’s Show Me Your Pedalboard entry comes from Geremy in Chicago, Geremy holds down the low-end for Eagle Kings: which is an experimental-post-rock 3 piece. Let’s run down his dirt heavy dual board setup and see what he is working with! He starts out by running his Gibson EB right into the Ernie Ball VP Jr Volume Pedal into a GK Rails pedal which came to life on the Talkbass.com forums as a collaboration between FEA Labs and Designer/builder JohnK-it’s a poweramp sim/boost and distortion based on the GK 800RB-Geremy is using this very early in the game to add some punch to his sound, I love that this has an input level to balance a hot signal before feeding into the rest of the chain, great placement! From there he goes into the updated Digitech Bass Whammy! You can check out the PedalsAndEffects review here. From hand-made board 1 Geremy jumps to a Saturnworks Kill switch that he uses for a stutter effect, right into the Minifooger Ring Mod with the frequency knob being controlled by the Moog EP3 expression pedal on the first board, being a fan of the original Moog MF-102 I have to confess I appreciate the Minifooger version just as much because you’re able to get many of the same sounds of the original in half the size, standard power and no need to deal with the “always on” drive knob of the original! From there into a Dwarfcraft Devices Great Destroyer an evil little fuzz that goes beyond dirt there are hours worth of glitchy, sputtery, doom sounds to be found in this one! It goes into the BYOC Leeds Fuzz, a DIY style 60’s Univox Superfuzz without the collector price tag and board space. Keeping with the fuzzy spirit Geremy takes his tone to another Dwarfcraft Devices creation the Baby Thundaa which was featured in an Early Fuzz War, this is a solid alternative to it’s mighty big brother the Eau Claire Thunder but is no longer in production. That goes into another fantastic Fuzz by Malekko the Diabolik, which was developed by good friend and bassist Justin Meldal-Johnsen check out our review here. Geremy then overdrives his sound by going into a classic DOD 250 overdrive/Pre and adds a killer distortion in the form of a Fuzzrocious Rat Tail a more bass friendly ProCo Rat clone with multiple clipping options. His sound really takes shape by feeding into a Mesa Boogie V1 Bottle Rocket, a tube preamp/overdrive-I would move this towards the end of the chain post the remaining effects for direct-to-board use but a killer tone shaper nonetheless-boosted by a Rusty Box by Tronographic phasing things out with the EHX Small Stone Nano series fed and chopped into the Seymour Duncan Shape Shifter tremolo pedal, I haven’t had much of a chance to use this but the pan/stereo phase option could really shine through your 2 amp configuration! Followed closely by the already legendary Earthquaker Devices Afterneath into another Minifooger the MF-Delay, I recently had the chance to play with the Afterneath and this delay together and found they sound fantastic together in either order- The MF-Delay sounds beautiful on bass, if you can get an expression control on this the time and feedback parameters are extended past the knob range-Take it to 15! 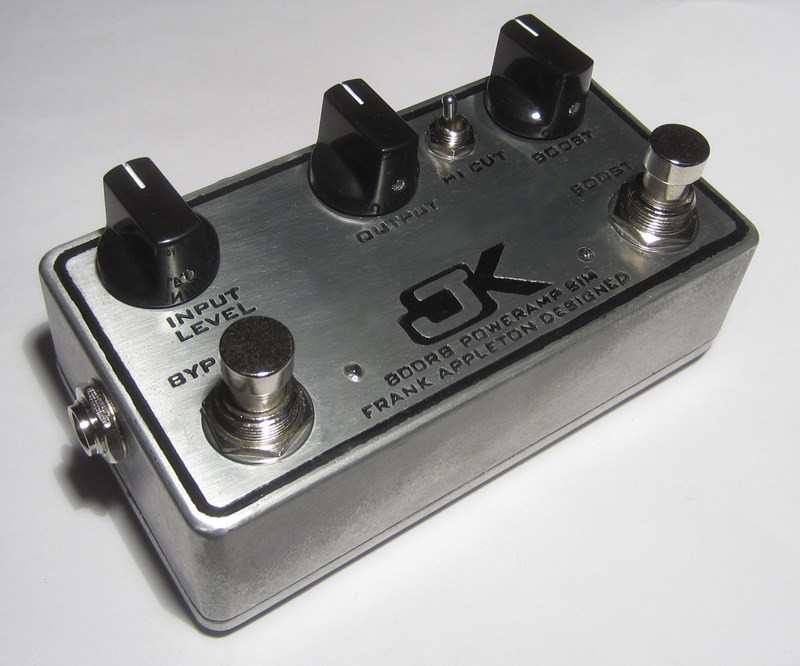 Rounding off the chain is the DOD BiFet FX10 preamp, a pedal that will always have a place at PedalsAndEffects! What an adventurous pair of boards Geremy, thank you for sharing such a well-designed setup with a great mix of small boutique companies, DIY craftsmanship, and classics from the heavy hitters! Send in your board to juan@pedalsandeffects.com to have it featured here on PedalsAndEffects!